As we programmed my national public radio show Sound & Spirit every year, we tried to throw in something seasonally appropriate. Valentine's Day was the best - our programming ranged from the affirming . . . .
From Edvard and Nina Grieg to Gala and Salvador Dalí, Benjamin Britten and Peter Pears to Lotte Lenya and Kurt Weill, Sound & Spirit explores the intimate, extraordinary, sometimes unusual relationships crafted by two people in love. Hear words and music by and about significant others, and sample the sweet fruits of conjugal affection and creative partnership. . . . . to the "Yeah, well, what about those of us who are NOT in a couple this year?" cranky . . . .
Like the beginning of a relationship, the breakup of a romance is a time brimming with possibilities and questions. Questions about the future: Who am I now? How can I live without you? What will I do with my freedom? Will I ever love again? Questions about the past: What was it that we had together? Is it gone now? Did I waste those years? In this award-winning program, Ellen Kushner looks for answers, with the help of poets and musicians from around the world. What is the line between Carnal and Divine love? Over the centuries, music, poetry and mysticism have blurred it, and each one has fed the other - as we'll hear in this week's show! Ellen explores the way that American Gospel music provided the heat for Motown Soul, how the Sufis of Turkey and Pakistan sing of divine passion being found through earthly friendship, and how a modern rock singer, Joan Osborne, even turned to Sufi star Nusrat Fateh Ali Kahn to learn how to express her passion. Click on each title to listen to the show. Playlists are clickable on each show's page. And if you can figure out a way to get rid of that irritating blue stuff above (without re-typing the whole thing) . . . just let me know! HELPED US SAY FAREWELL TO ENDICOTT WEST in community. Hey! Look what else we've dug up while packing up our beloved arts retreat! Even if you've never been here, this is a great chance for you to keep a piece of Endicott West history . 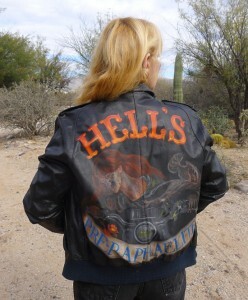 . . or to acquire unique works of art by Terri Windling, the creator and presiding spirit of Endicott Studio, the Journal of Mythic Arts, and the original Boston Endicott Studio - which gave its name to Tucson's Endicott West. Thanks to everyone who bid on our previous auctions this week. Running concurrently with this one is the Pre-Raphaelite Blow-Out, which also includes boxes of Liberty Prints & Guatemalan Fabrics from the Endicott West retreat. * exceptions to this: SARAH CANARY, OUR LADY OF THE HARBOUR (both first editions), signed (but not inscribed) by de Lint. Fowler not signed, but in pristine condition. Everything else has some version of: "To Endicott West" plus a date, by authors & illustrators who stayed here 2002 - 2014. 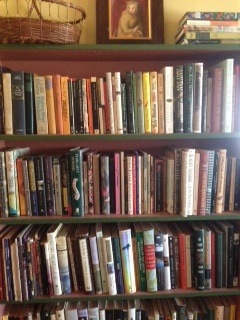 All books are shown above . . .
See some of the photos and comments by guests who've stayed at Endicott over the years. …and she's thrown in some extra prints from her Etsy shop, because she's such a nice person! 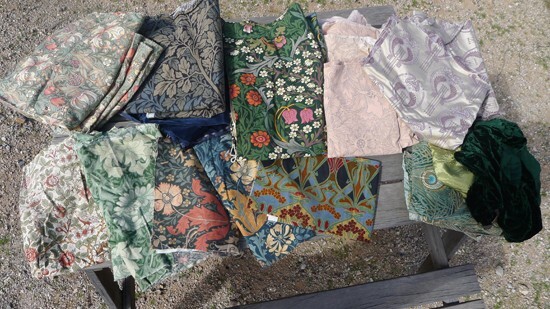 Also visit the Endicott Pre-Raphaelite Auction (last post) - bid here for Morris fabric, PLUS Guatemalan & Cowboy Quilting Fabric from Endicott West! 1) LOOK below in Comments for the SUBJECT LINE for either #1 (BOOKS + t-shirt + sweatshirt) or #2 (SKETCHES). 2) Click REPLY UNDER the LAST (most recent) HIGH BID on the one you're interested in (NOT in the General Comments for this post! and NOT under the "Minimum Bid" Comment, either), being sure to bid higher than the person before you did. And say what you're bidding on, just to avoid confusion. YOU DO NOT NEED TO BE A LIVEJOURNAL member to bid: JUST COMMENT as a GUEST - but leave a name so we know who you are. HIGHEST BID in each category at 11:59 p.m. EST on Wednesday, January 29th wins. We will notify you HERE in Comments, so check back to see if you won so we can contact you. If we don't hear from you in 48 hours, the prize will go to the next highest bidder. Nothing will be mailed out before we have received your PayPal payment of your pledged bid, which should be within 48 hours of our hearing from you. • U.S. only - no mailing abroad: Sorry, but the extra work of figuring postage & filling in customs forms is just not something any of us can cope with as we close up the house. If you've got a friend in the US who will accept the package for you, that would work for us! • Books will be mailed by Feb. 8th, at Media Rate. 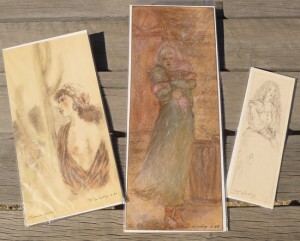 Endicott West Farewell Pre-Raphaelite Auction Blowout! So many treasures have emerged as we close up our beloved Endicott West arts retreat in the Tucson desert! All her life, Terri Windling has had a passion for matters Pre-Raphaelite. Her precious collection spans the decades . . . and now it's time to pass some of it on to you. 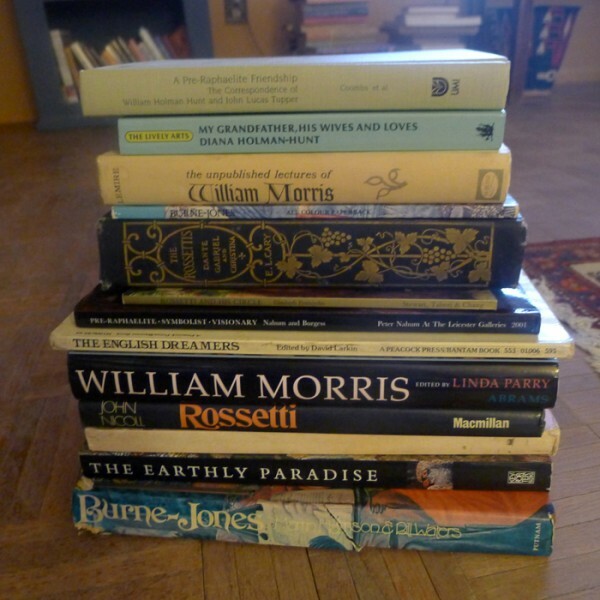 For those few hearts unmoved by William Morris & Co., we offer a final cache from the soul of our little retreat . . . . So click on, and bid high: All proceeds go to moving a portion of Terri's things across the Atlantic, and to help repair the flood damage recently done to her home in the UK. 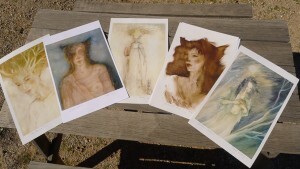 OK, so after 20 years in the desert, Jane Morris looks a bit like Rossetti dug her up along with his poetry…. But don't worry: We're sending it to Cortney to touch it up so you can wear it for another 20! 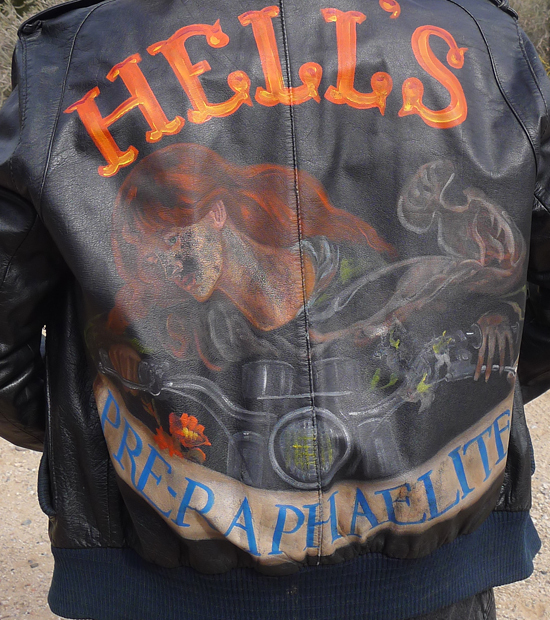 As a result: This jacket will not be available before April 2014. But it will be so worth it…. The complete set is pictured here in these 2 photos. For HIGH-RESOLUTION images, see Terri's post here. Scraps of fabric large and small (patterns below) which have adorned everything from seat cushions in Terri's original Boston North End Endicott studio, to bits of her celebrated collages, to tabletops at Endicott West. Liberty's has stopped making many of these. NOTE: These are smallish pieces, pretty much only suitable for quilting. Includes some velvets to go with them! WANT MORE FROM ENDICOTT WEST? 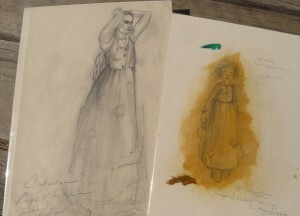 CLICK HERE for two very special additional auction offers from the famous Arts Retreat founded by Terri Windling, Delia Sherman & Ellen Kushner . 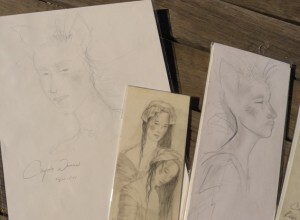 . . lived in, loved, and visited by artists and authors including Emma Bull, Charles Vess, Charles de Lint, Ellen Klages, Alan Lee, Karen Joy Fowler and many more. Come see . . . .
1) LOOK below in Comments for the SUBJECT LINE for either #1 (Jacket), #2 (Pre-Raph books), #3 (Morris), #4 (Pre-Raph fabrics) or #5 (Guatemalan fabrics). HIGHEST BID in each category at ETA: 11:59 p.m. EST on Wednesday, January 29th, gets the box. • Books will be mailed by Feb. 8th, at Media Rate. Fabric will be sent UPS or USPS. THE AUCTION IS CLOSED. Thanks for your bids! 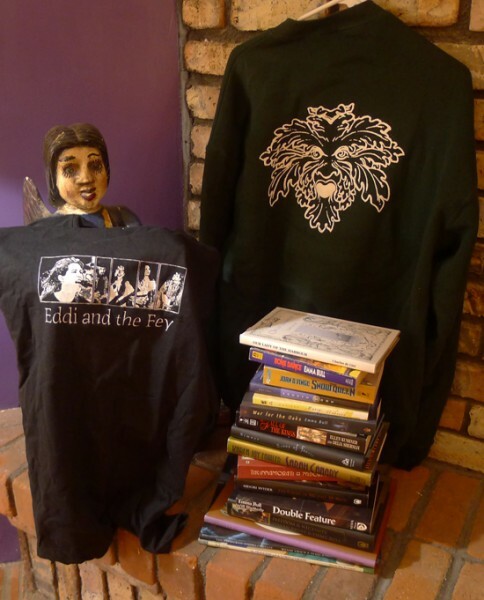 Thanks to your support and enthusiasm for the Endicott West retreat and author, artist & editor Terri Windling's prodigious library here, we're offering four more fabulous flash auction packages, hand-chosen by Terri herself: a Baker's Dozen in each of some pretty special volumes. These are the last of these sort of boxes; all that's left is Monday's Pre-Raphaelite blow-out, which will feature art books and even fabrics. And then we're done. Your purchases are helping us to move her most important books, papers and lifelong possessions to her home in the U.K. - and at the same time giving tremendous joy to know that a lifetime of careful book-collecting is going to people who will truly value its fruits. Many of these are the books from which Terri selected stories for her ground-breaking Year's Best Fantasy & Horror series. It's a beauty; all Pre-Raphaelite-lovers will want to know about this one! That will be our final auction, and then we're done. ETA: One more to add: We just found a big stack of books by authors who have stayed here, signed to Endicott West! Includes Emma Bull, Ellen Kushner, Charles Vess, Charles de Lint & more. 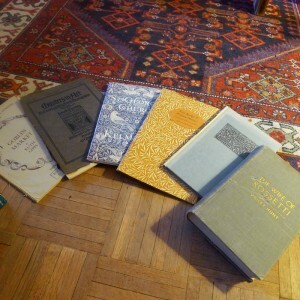 Some first editions. This will go up next week. The perfect way to close out the Retreat, and give someone a little piece of its history. Bidding will start over $100 on this and the Pre-Raph collectibles, so if your budget is tight, we suggest you try for the ones listed here. It is sad to be clearing out Endicott West, which was an arts retreat for many years, as well as being the Arizona home to Terri Windling, where she created so much great work inspired by the Sonoran desert and its people. Terri's prodigious library here has given many people joy over the years, and I wish we could teleport it all to her little cottage in England - and build a new room to house it all in! That being impossible, we're making sure it all goes to good homes (including the Special Collection at Northern Illinois U.) - and one of those homes could be yours! 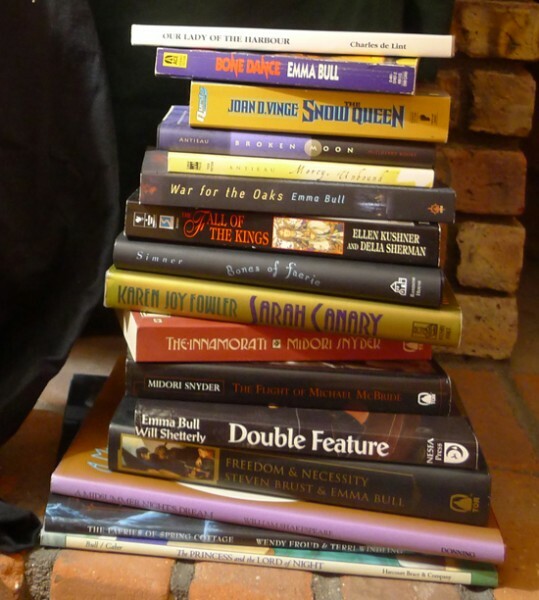 Including: Swan Sister; The Green Man; Ruby Slippers Golden Tears; Black Swan White Raven; Salon Fantastique; Sirens [all co-edited with Ellen Datlow]; The Essential Bordertown; Faerie! ; Elsewhere Vol. 3 . . . and maybe a few surprises. Each will be signed by Terri. There will be *2* winners on this one: The last 2 high bids each get a box. At least 9 hardcovers + as many paperbacks as we can fit in the box of books Terri really loves, and has probably talked about on her fabulous blog and/or the Journal of Mythic Arts' celebrated "100 Books of Mythic Fiction." You won't be disappointed. Authors may (but are not guaranteed) to include Alice Hoffman, N. Scott Momaday, Vikram Chandra, Katherine Vaz, and others whose work Terri brought to the fantasy reading public's attention through her 20 years of groundbreaking work on The Year's Best Fantasy & Horror. 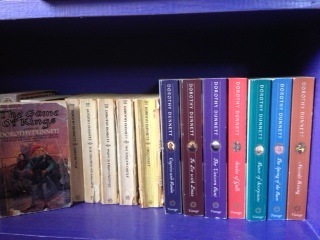 3) Terri's personal collection of Dorothy Dunnett novels! 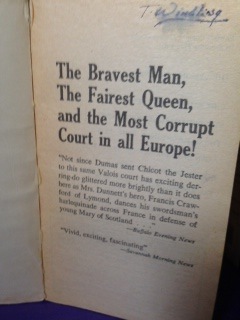 You've heard me speak of them often: the Lymond Chronicles (recently discussed in my Facebook thread here): here offered in the 1980s paperback edition, with Terri's eye tracks on each page, and her wails of anguish across our apartment still ringing in my ears . . . Plus the Niccolo series, in the fancy trade paper edition, which she swears is all worth it once you get to the last volume. Look for those later today! 1) LOOK below in Comments FOR THE SUBJECT LINE for either #1 (TW Edited Collection), #2 (Surprise Box), or #3 (Dunnetts). 2) Click REPLY under the one you're interested in, being sure to bid higher than the person before you did! HIGHEST BID in each category at NOON EST on Friday, January 24th, gets the box. We will reply HERE in Comments, so check back to see if you won so we can contact you. U.S. only - no mailing abroad, unless you're willing to pay international shipping yourself. Books will be mailed by Feb. 8th, at Media Rate. If you want them faster, be willing to pay the extra postage. Writing as a Romance with what you're Reading? "In the words of A.S. Byatt, who worked with [Penelope] Fitzgerald at Westminster Tutors, the London crammer, she was ... ‘someone with an austere, original talent’, and Byatt presents the way she came to understand this as an epiphany. ‘She said to me about Human Voices’ – the scent rising, perhaps, from the sausage roll Fitzgerald was warming up on the radiator for lunch ['cause how could I cut that? - ek] – ‘that she wished I would write something … to point out that it was based on a German poem by Heine, “Der Asra”’. Fitzgerald’s fourth novel, on the face of it a tragicomedy of love and loss among careworn bosses and dewy office girls at the wartime BBC, resonated, in its author’s mind at least, with a poem in which a Yemeni slave explains how, for the people he comes from, to love is to die. We are talking about a writer for whom intellect was a passion, and whose books as much recount romances with whatever she has been reading as they do anything else." --Not Penelope Fitzgerald, obviously - unless she's a particular passion of yours - but if you write, do you do so in conscious - or unconscious - dialogue with other things you've been reading? I would have said, "Probably not anymore" - but I am very conscious right now of the fact that all my first published work absolutely was just that! I am re-reading Dorothy Dunnett's the Lymond Chronicles [a fun discussion on FaceBook], and it's bringing it all back - just how bouleversée I was by that series, and how much I learned from her technique, both consciously and un-. I'm seeing now even more clearly what a perfect master she is of characterization, pacing, transitions, and POINT OF VIEW . . . but that's another post. I just mean to begin by answering my own question by saying that there have definitely been times when my work has been, not so much a romance with what I've been reading, as a response to it - or a way of engaging with it in some manner. I'll be curious to see what you have to say about your own. Thanks to the divine Paul Cornell, I am reminded that nominations for the 2014 Hugo Awards are now open, and that it is not shameful to let others know that one has eligible work. Rules for who is eligible to nominate for the Hugos are here. You can nominate for the Hugo Awards (if you've an attending or supporting member of this year's, last year's or next year's Worldcon) here. More info (including fact that deadline is March 31st) here. ETA: Bo Bolander reminds us: "If you attended LoneStarCon last year, you can vote on the Hugos/Campbell this year. It's that easy!" Produced by SueMedia & Ellen Kushner, narrated by Ellen Kushner (co-author with Delia Sherman), the audiobook features original music by Nathanael Tronerud composed for the Riverside Series, book by book, this book being the culmination. Using our new "Illuminated" audiobook technique, SueMedia also creates original sound effects throughout, and we invited a host of wonderful actors to bring some of the dialogue to life - including the great Simon Jones (the original Arthur Dent in Hitchiker's Guide! ), audio award-winners Katherine Kellgren, Nick Jones, Robert Fass . . . and Neil Gaiman as The Wizard in the Dreams! Read more about it and listen to sample clips here. I would point out the the first book in the series, Swordspoint, won an Audie Award in 2012, so we're selling quality goods here. And that, ehrm, very very few people actually nominate and vote in the Hugos, so every vote genuinely counts! Hollins U. Summer Writing & MA Program...Now with ILLUSTRATION! Hollins MFA Program is where Delia Sherman & I teach every other summer. We'll be there next in 2015 - joined by Writer-in-Residence Terri Windling-Gayton! I cannot recommend the place too highly: Ruth Sanderson & her fellow Illustration instructors ashley wolff & Elizabeth O. Dulemba are creative, funny, charming & supportive teachers, and have become dear friends. Our academic and writing colleagues there (including in 2015 the amazing Karen Coats, hurray!!) have, too. This new program weaving together the 2 programs is the It if you want to illustrate! If not, the Vanilla MA/MFA program is still available - and if you attend this year (2014), you'll be eligible for my 2nd year Seminar next yea (summer 2015). Think about it. We're happy to answer any questions you might have. The fact that it's in the foothills of the Blue Ridge Mountains, with Appalachian traditional music just down the road, doesn't hurt any either. Just sayin'. NYC: House Concert/Lecture Sunday 12/15 4:00-6:00 p.m.
Delia Sherman & I are doing a holiday "house concert/lecture" - just think of it as coming and hanging out with us in a living room on the Upper West side, while we shoot the breeze about the way that fantasy literature and traditional folk music play nicely together and make beautiful children. Come with your own examples of books and stories that do the trick, or get ready to hear us talk - and sing! - about Ellen's World Fantasy Award-winning novel THOMAS THE RHYMER (based on a Scots Border Ballad), and Delia's multiple short stories, like "The Maid on the Shore," plus, of course, her novel THROUGH A BRAZEN MIRROR (from Martin Carthy's rendition of the ballad "The Famous Flower of Serving-Men) . . . and how Ellen stole - er, recycled one of its plotlines. And, yes, there will be singing. To find out the Secret Location, call Heather at (212) 957-8386 for reservations and information. General admission: $15. Folk Music Society of NY members or full-time students: $12. For [love] and for valour he rode through the land. When a Knight Won His Spurs is a children's hymn written by Jan Struther and set to a folk melody (Stowey) and harmonised by Ralph Vaughan Williams.The hymn first appeared in Songs of Praise in 1931. Hear it beautifully done by my new favorite British folk duo, Josienne Clarke & Ben Walker.